As an educational design researcher, it was concerning to encounter so many media reports about the detrimental effects of math anxiety but not nearly as much about how to address it. 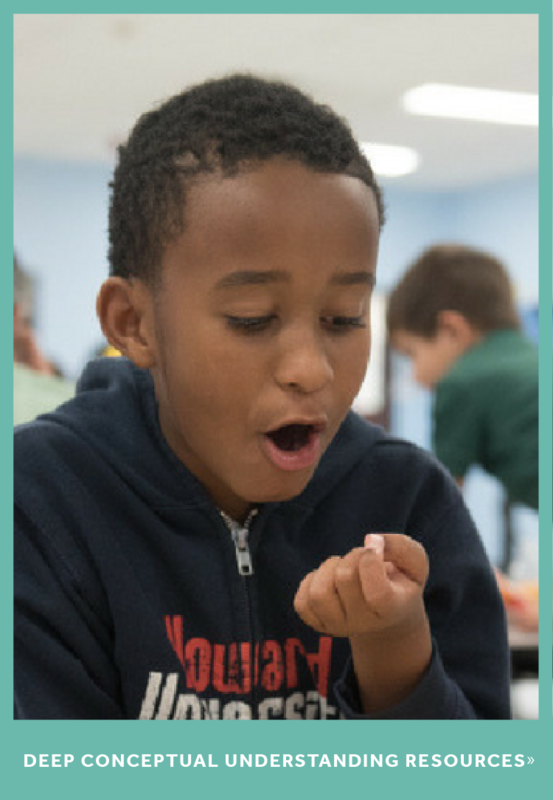 We know that many students experience math anxiety first-hand: that feeling of fear, apprehension, and helplessness when tackling a math problem. And research shows that these high levels of anxiety are linked to poor math achievement, inefficient problem solving, and low confidence in math abilities. This goes for both young students and the adults around them. In fact, the above New York Times article highlights research showing that the children of more math-anxious parents performed worse on the subject and were more likely to develop increased math anxiety when their parents frequently helped them with math homework. In other words, it seems that parents can do more to help their children’s math scores by changing their own attitudes and feelings around the subject. Well, yikes. What can we do about this rampant problem? Now that we know that students often experience math anxiety, and that anxiety is associated with adverse outcomes related to learning and motivation, how can we design learning environments to address that? After diving into the work related to math anxiety, I’ve collected several research-based solutions that have promising results and that educators can try adapting and using in their classrooms. A couple years ago, I heard Gerardo Ramirez, now a researcher in developmental and cognitive psychology at UCLA, speak about experiments in which his team asked students to write about their thoughts and feelings regarding an exam shortly before taking it. Those who jotted down what was on their mind had higher exam scores than those who were not asked to write about the pending test. Ramirez and his colleagues think this writing intervention worked because it helped students reflect on and regulate their emotions. In addition, worries about math compete for the same working memory used for solving math problems. The working memory system allows us to temporarily hold and manipulate objects, concepts and numbers in our minds. It may be that the expressive writing got those anxiety-provoking worries out of the way to free up more working memory, thereby improving math performance. And relatedly, a separate study using fMRI brain imaging found that identifying and labeling negative emotions lessened activity in the amygdala, a brain region involved in generating emotions. Though Ramirez’s published research involved high school and college students, it has implications for younger students as well. I wanted to think more about this, so I called him up to talk about adapting his research findings in a usable way for elementary and middle school educators. We worked together on incorporating his research insights into the design of this expressive writing and drawing template, and we welcome educators to try this out in classrooms. This template is intended to help students learn how to label their emotions and then reflect on them, and in doing so learn how to manage these emotions and not let them get in the way of deeper learning. Reframing anxiety as excitement is another technique that has resulted in improved math performance, according to Alison Brooks, a researcher of emotions at Harvard Business School. The idea behind this is that anxiety and excitement are both physiologically linked to faster heartbeats and cortisol surges; however, psychologically, they can have very different effects. Excitement often puts people in an opportunity mindset (aka: “I can do something about this” mindset); whereas anxiety, especially at high levels, can put people in a threat mindset. A threat mindset is concerning because research shows it can result in physiological reactions that can be detrimental to one’s health as well as prevent focused problem solving. In Brooks’ study, she showed participants the written message, “Try to get excited,” on their computer screens before giving them difficult math problems to do. This resulted in better math performance than showing the message, “Try to remain calm,” or the neutral message, “Please wait a few moments.” Part of the reason for this, she explains, may be that shifting from anxiety to calmness requires more effort because it is not just a psychological shift but also a physiological shift to a lower state of arousal. There is, however, a way to instill calm in students that has been linked to improved math performance. In a study by Tad Brunyé at Tufts University, students practiced breathing techniques and different levels of attentional focus. The highly math anxious students in the group who practiced breathing with high attentional focus reported greater calmness and performed better on a timed math test. A potential reason for this is that the mindfulness training may have helped students ignore distractions that take up working memory space, and these students then had more cognitive capacity to use for solving the math problems. 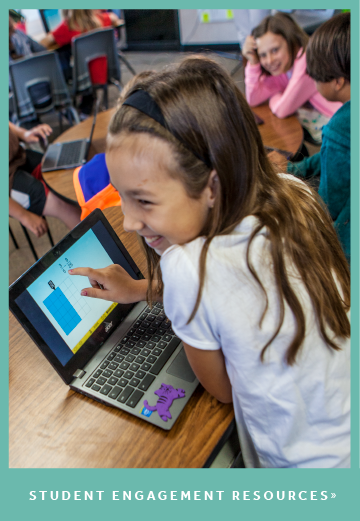 The research team speculates that another reason for the improved math performance could be that relaxation training changes the classroom atmosphere; for instance, mindfulness exercises could result in students perceiving their teacher as less threatening and more responsive, thus lowering their math anxiety and improving math performance. Here’s a helpful collection of articles from MindShift on the topic of mindfulness and learning. 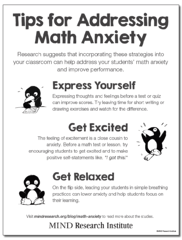 Given the endless news headlines warning us about the negative implications of math anxiety, these are a few research-based strategies to help turn your schools and classrooms into less anxious and more relaxed learning environments. The research tells us that this can help improve math performance. Although some of this research was conducted in university labs with children and adults in different contexts from classrooms, and therefore could play out differently in other situations, they do show promising directions and provide educators with potential solutions to the detrimental effects of math anxiety. Beilock, L. S., Gunderson, E. A., Ramirez, G., & Levine, S. C. (2009). Female teachers’ math anxiety affects girls’ math achievement. Proceedings of the National Academy of Sciences, 107(5), 1860–1863. Brooks, A. W. (2014). Get excited: Reappraising pre-performance anxiety as excitement. Journal of Experimental Psychology: General, 143(3), 1144. Brunyé, T. T., Mahoney, C. R., Giles, G. E., Rapp, D. N., Taylor, H. A., & Kanarek, R. B. (2013). Learning to relax: Evaluating four brief interventions for overcoming the negative emotions accompanying math anxiety. Learning and Individual Differences, 27, 1-7. Chang, H., & Beilock, S. L. (2016). The math anxiety-math performance link and its relation to individual and environmental factors: a review of current behavioral and psychophysiological research. Current Opinion in Behavioral Sciences, 10, 33-38. Lyons, I. M., & Beilock, S. L. (2012). When math hurts: math anxiety predicts pain network activation in anticipation of doing math. PloS One, 7(10), e48076. Maloney, E. A., Ramirez, G., Gunderson, E. A., Levine, S. C., & Beilock, S. L. (2015). Intergenerational effects of parents’ math anxiety on children’s math achievement and anxiety. Psychological Science, 0956797615592630. Park, D., Ramirez, G., & Beilock, S. L. (2014). The role of expressive writing in math anxiety. Journal of Experimental Psychology: Applied, 20(2), 103. 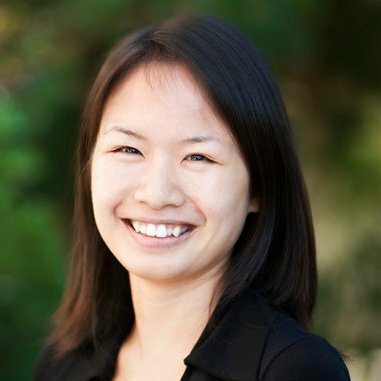 Cathy Tran, Ph.D., was a Design Researcher at MIND Research Institute. When she's not learning more about student motivation and cognition, she enjoys planning travel adventures around food.